Looking to replace your Toronto brick fireplace face with a different material? It’s not an easy task to tackle alone but with the right team of mason experts on your side it could make for a valuable investment. 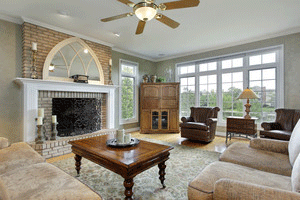 Older brick fireplaces tend to develop a lot of stains that are next to impossible to remove. Changing the exterior of your fireplace adds a new touch to the overall décor, as the fireplace and surrounding mantel are a focal point of any room. Our clients have used words like ‘ugly’, ‘disgusting’ and ‘I hate it’, to describe their old brick fireplace face. We’re sure you have some words of your own, but before you start tearing down unsightly brick, here are 6 important things to take into consideration. Before you get start demolishing your old fireplace and buying new materials, it’s important to consider all facets of the project. This includes any building permits that you will need to obtain. Local building codes help determine things like how far the hearth must extend out from the firebox. A noncombustible material must also cover the areas on the sides and top of the fireplace opening. Generally, measurements are around 8 to 12 inches on the top and sides, and another 18 inches (minimum) for the hearth. Don’t shortchange yourself on hearth size, you don’t want a shallow hearth that allows embers to escape and stain your carpet, or worse start a fire in your home. 2. Are There Any Structural Issues? In most cases, the desire to remove and replace brick façade on the fireplace relates to purely cosmetic desires. Even all appears sound and sturdy, it’s important to make sure there are no structural issues with the fireplace before investing in this type of project. If there are structural issues that need to be tended to, we recommend taking care of these prior to installing a beautiful new fireplace façade. 3. What Is The Removal Process Like? Removing a brick fireplace face is the biggest part of the job because it tends to be rather labor intensive. All surrounding furniture, carpets and so forth should be covered during the demolition process, as things are going to get pretty dusty. Once the wall and firebox are removed and the surface is cleaned up, you’re ready to install a new facing. 4. What Materials Can You Use On New Fireplace Face? The only rule regarding fireplace face materials is that materials MUST be noncombustible. People commonly replace brick with marble, stone or tile. Be careful using materials that are too heavy, as the floor framing must be strong enough to support the weight. You may need to have concrete pillars and a beam installed across floor joists in order to support heavy materials. Adding stone or a different type of brick requires the use of a steel bar placed across the top of the firebox, this helps to support the additional weight of these materials. In order for the new materials to affix properly to the wall, it’s adamant to create a smooth, flat surface. There are several DIY ways of doing so, such as plastering a mortar bed on top of the existing brick, or using a cement board with a thin layer of mortar. Concrete nails can be used to hold the board in place, and after the mortar dries you have a flat workable surface. The exact process you use should vary depending on the materials you plan to replace old brick with. We highly recommend leaving it to the professionals in order to get a top quality finish that lasts for many years to come. Since you’re already having professionals out to work on the fireplace, you might as well kill two birds with one stone and have your fireplace inspected as well. Annual fireplace inspections are highly recommended, generally prior to winter before your fireplace gets the most use. Fireplace inspections help prevent house fires, toxic fume exposure and many other potential hazards your fireplace presents. For all Toronto masonry work, contact the leading professionals at Turnbull Masonry!